Patrick Henry was a complex man. We all remember him as the patriot who thundered the immortal words, "Give me Liberty, or give me Death." In school that's about all they tell you about him. But he was so much more. And Mr. Unger does his level best to make sure that we see this extraordinary man from all angles. 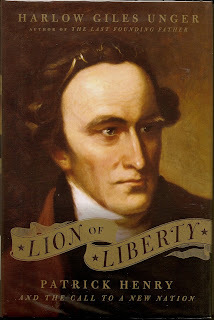 One of the most overlooked of our "Founding Fathers", Patrick Henry came from a family of lawyers. Several generations, in fact. His faher was the presiding judge in the Virginia County in which they lived. At that time in Virginia, farmers of tobacco were obligated to cede a portion of their crop to the Anglican Church. The Church then sold this crop for a profit as a means to survive. But what happened when a bad season ruined the crops through drought, or even flood? When the weather didn't co-operate and the farmers bought in no crop, the Parsons wanted their money anyway, even at the cost of bankrupting the farmers. The Colonial Governor authorized the "Two Penny Act", which guaranteed the Parsons 2 cents per pound of tobacco, even in bad years. The Parsons complained to the King, after all, with tobacco scarce the price had gone up and they wanted more than their usual share of the profits. The King agreed and nullified the act of his own Governor. The Parsons then filed suit for the monies owed them, but at the higher rate, which would bankrupt most of the planters. The planters, in turn, called upon Patrick Henry, who had never tried a case in court before, for their Defense. The fate of nearly every farmer in Virginia was resting on this young and untested attorney. This case became known as "The Parson's Cause." With the keen eye of a surgeon he took the position that there was a contract between the Crown and the People. The people worked and a portion of that work went to the Crown for protection in times of war, stable governance and economic well being. When the King nullified the Two Penny Act, which had been drafted by his own Governor, in Mr. Henry's opinion, the Crown broke that contract, freeing the people to do as they would. When Mr. Henry won the case the King came up with the Stamp Act. The British hoped that by requiring the affixing of tax stamps to all legal documents, and newspapers, enough money would be generated to pay for the British soldiers who provided protection against Indians in the Western Colonies. The King's aim may have been legitimate, but his timing couldn't have been worse. The whole episode caused the colonists to convene the "Stamp Act Congress." The Revolution was underway. This is a very well written, and somewhat complex look, at a man who was well ahead of his time in almost every facet of his life. He was a proponent of Abolition, yet, like most of the Founding Fathers, held slaves. He was a devout family man, and as gregarious a character as his compatriot Thomas Jefferson. An avid fiddler, he often frequented the local pub to play his fiddle after a victory in court. Shortly after his brilliant victory in the Parson's Cause case, he became the most sought after attorney in the colony of Virginia. The book follows Mr. Henry through the years of the Revolution, showing the part he played in making it happen. Thomas Jefferson once said of him, that "Mr. Henry gave the first impulse to the ball of the Revolution." High praise, coming as it did from Mr. Jefferson! Mr. Unger has done a wonderful job of pulling together the many pieces of history that comprise the story of the American Revolution. He follows the path of Patrick Henry throughout the War, as the colonists struggle to attain their Independence from the Crown. The author follows the Colonial Army as it barely survives the winter at valley Forge, and Mr. Henry rides throughout the colonies, in an effort to keep the troops supplied with clothing, food and ammunition. This is an insightful read into the causes, and eventual triumph, of the American Revolution, as well as an exciting chronicle of the life of one it's principal players. Set, as it is, against the backdrop of a changing Europe and the War between France and England, the book also explores some of the petty, and not so petty, differences that were dividing our own leaders at the time. The debate on whether to revolt or not, during which Patrick Henry unleashed his famous quote, is but a small part of a large and grandiose story that would come to affect the whole world.